Purpleish-red and green mustard with large leaves and a fiery spice. The young leaves are of a succulent delicate peppery flavour. When harvested fully matured, the leaves might surprise you with their bold pungency. Glucosinolates are responsible for that mustard spice. When cooked or steamed like other greens however the taste will be mild and similar to spinach or chard. 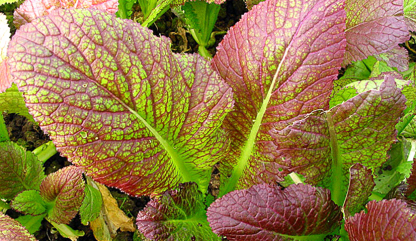 Giant Red Mustard seeds are also excellent for sprouting.